Comprehensive review of Clarins Self Tanning Instant Gel. See what the experts and actual users have to say about this self tanning product. Clarins Self Tanning Instant Gel is a very good self tanner. On the positive side, it smells nice and produces some of the best color we’ve witnessed to date. On the negative side, it takes forever to dry and is very expensive compared to most other self tanners. Overall, if you’ve got patience and a big wallet, this is a great product to try! Putting Clarins Self Tanning Gel on your body isn’t very difficult. Being a gel, it glides on smoothly and tends to easily cover anywhere you put it. Despite being pretty easy to use, there are a few things that may bother some tanners. First, the gel can feel a little greasy as you cover more and more of your body with it. Although it comes out of the tube light and breezy, it starts to feel a little thick as you cover your body. Second, this product doesn’t have a guide in it. That’s not a big deal to us, but some people like to know exactly where they’ve put the product (so they know if they’ve missed any areas). By the way, for those who don’t know a guide is simply a dye added to the formula that shows you where you’ve put the product. It washes off easily in the shower the next morning. Despite these two drawbacks, applying this product won’t be too much of a problem for most people. And because it doesn’t have a guide, it doesn’t stain your sheets like most self tanners with guides do. The clear, lightweight gel tends to stay put (once it has dried). This is the reason why Clarins Instant Self Tanning Gel didn’t rank higher in our review. This product takes a LONG time to dry, and quite honestly, never feels like it’s completely dry (until the next morning). That means you may want to wait an hour or two before getting dressed or going to bed. Clarins Self Tanning Instant Gel has a very nice, clean, citrus-inspired smell. To some of our testers, it actually smelled like an orange, or similar piece of fruit. After this product had dried, it still had that nice, citrusy smell to it. And the following morning the smell wasn’t too bad either. Clarins Self Tanning Instant Gel produced some of the best color we’ve seen in any self tanning product. All of our test subjects reported a nice, even, smooth bronze color the morning after application. And it got pretty dark compared to most products as well. Further, we didn’t notice any streakiness, splotchiness or orange color whatsoever. I have a feeling most people are going to really like the color this product produces. Clarins self tanner lasts longer than virtually any other self tanning product on the market today. Although it started to fade after 4-5 days (like many top-rated products), we could still see color a good 7-8 days after application! That’s pretty amazing when you consider how self tanners work. Yes. This is a good choice for men as it has no tint to it and the smell is strong but neutral. It does take a long time to dry though. Clarins Self Tanning Instant Gel is definitely expensive compared to most other self tanners on the market today. At $34 for a 4.2 ounce tube, you’re looking at paying $8.09 per ounce, which is on the high side. They just recently reduced their tube size from 4.5 ounces down to 4.2, which effectively raised their price. 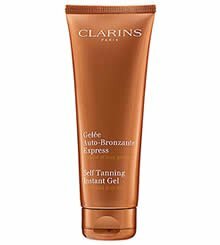 To buy Clarins Self Tanning Instant Gel, click here.